1 Why does Lord Ganesha have a mouse as his vehicle? Contributed by: Gaurav Moghe. Adapted from the Wikipedia article on Ganesha. Ganesha dancing on his mouse, 11th century, Bengal, Musée d'art asiatique de Berlin. Actually, the earliest Ganesha images are without a vahana (mount/vehicle). Of the eight incarnations of Ganesha described in the Mudgala Purana, Ganesha has a mouse(shrew) in five of them, uses a lion in his incarnation as Vakratunda, a peacock in his incarnation of Vikata, and Shesha, the divine serpent, in his incarnation as Vighnaraja.Of the four incarnations of Ganesha listed in the Ganesha Purana, Mohotkata has a lion, Mayūreśvara has a peacock, Dhumraketu has a horse, and Gajanana has a mouse.. Jain depictions of Ganesha show his vahana variously as a mouse, elephant, tortoise, ram, or peacock. 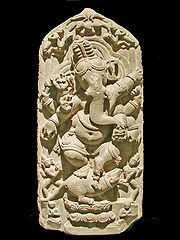 However, most often, Ganesha is shown riding on or attended by a mouse, shrew or rat.. The rat began to appear as the principal vehicle in sculptures of Ganesha in central and western India during the 7th century and was always placed close to his feet.. The mouse as a mount first appears in written sources in the Matsya Purana and later in the Brahmananda Purana and Ganesha Purana, where Ganesha uses it as his vehicle only in his last incarnation. The Ganapati Atharvashirsa includes a meditation verse on Ganesha that describes the mouse appearing on his flag. There was a celestial musician-god by the name Krauncha. One day, in the court of Lord Indra, Krauncha accidentally stepped on the foot of Muni Vamadeva, who (as all Munis), got enraged and cursed Krauncha to become a mouse. However, Krauncha became a huge mountain-sized mouse and ended up damaging everything in its path. Once, he ended up stepping on the ashram of Maharshi Parashar, with whom Lord Ganesha was staying, and destroying it. Lord Ganesha, inorder to teach Krauncha a lesson, unleashed his pasha (noose) on Krauncha which ended up looping around the mouse and bringing him to Lord Ganesha's feet. Ganesha then said something like, "Krauncha...you have caused a lot of trouble and you deserve a severe punishment. But since you ask for my forgiveness, I will pardon you and use you as my vehicle". However, when Ganesha mounted on Krauncha, he couldnt bear the weight of Lord Ganesha. Krauncha pleaded for Ganesha to become light-weight so that he could support him. Lord Ganesha obliged and since then, has been using the mouse as his vehicle. Another belief is that Lord Ganesha is able to go into nooks and corners of the world and do his job as the Destroyer of Obstacles because his vehicle is a mouse, who basically can slither through tiny holes and narrow pathways, even in the darkness of night. This gives the quality of all-pervasiveness to Ganesha. Lord Ganesha is known as the Conqueror of Obstacles (Vighnaharta). In ancient times, when agriculture was the primary mode of sustenance, rodents were one of the biggest obstacles to prosperity. Rodents would destroy standing crops, eat up stored grains and thereby result in severe losses for the common man. Lord Ganesha, in having a mouse/rat as his vehicle, is symbolically shown to have conquered this pest, thus staying true to his name of Vighnaharta. For more details and complete references, please refer to this entry on Wikipedia. This page was last modified on 26 February 2013, at 14:19.